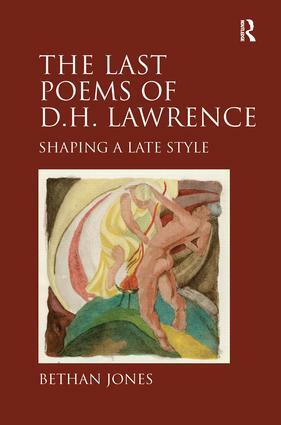 In the first book to take D. H. Lawrence's Last Poems as its starting point, Bethan Jones adopts a broadly intertextual approach to explore key aspects of Lawrence's late style. The evolution and meaning of the poems are considered in relation to Lawrence's prose works of this period, including Sketches of Etruscan Places, Lady Chatterley's Lover, and Apocalypse. More broadly, Jones shows that Lawrence's late works are products of a complex process of textual assimilation, as she uncovers the importance of Lawrence's reading in mythology, cosmology, primitivism, mysticism, astronomy, and astrology. The result is a book that highlights the richness and diversity of his poetic output, also prioritizing the masterpieces of Lawrence's mature style which are as accomplished as anything produced by his Modernist contemporaries. Contents: Foreword; Lawrence and late style; The 'nettles' and 'last poems' notebooks; Etruscan connections; Beyond the Chatterley machines; Elements of the pre-Socratics; All sorts of gods; Apocalyptic symbols; Ascension and carpentry; How to make an end; Bibliography; Index. Bethan Jones is a lecturer in English at the University of Hull, UK.